Several proposals related to voting policy draw majority support from the public. Still, only a handful – including automatically updating the voter registrations of people when they move and paper backups of electronic ballots – draw widespread support from both Republicans and Democrats. Others are favored more by one partisan group than the other. An overwhelming share of Americans (87%) say they would favor automatically updating voter registrations when people move, including 58% who say they strongly favor this idea. And there is nearly as much support among the public for requiring electronic voting machines to print paper backup ballots: 85% favor this, including 49% who do so strongly. About three-quarters favor removing inaccurate and duplicate registrations from voter lists using automatic methods (77%) and requiring all voters to show government-issued photo ID to vote (76%). 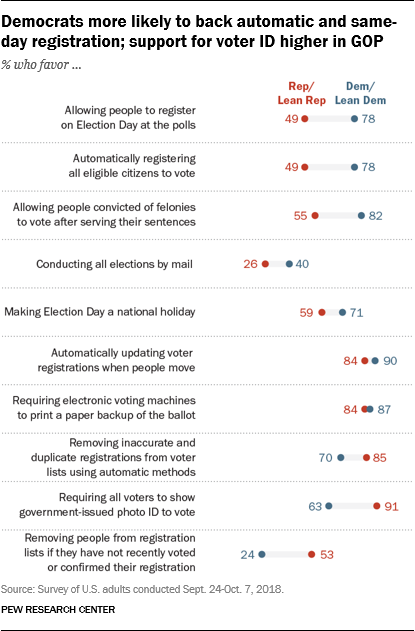 And roughly two-thirds of Americans favor allowing those convicted of felonies to vote after they have served their sentences (69%), making Election Day a national holiday (65%), automatically registering all citizens to vote (65%) and allowing Election Day registration (64%). The public broadly rejects two of the 10 policies included in the survey: 62% oppose removing people from registration lists if they have not recently voted or confirmed their registration, and a similar share (65%) opposes conducting all elections by mail. More than eight-in-ten of those in both party coalitions favor automatically updating voter registrations when people move (84% of Republicans and Republican leaners, 90% of Democrats and Democratic leaners) and paper backup ballots for electronic voting machines (84% and 87%, respectively). But there are notable partisan gaps when it comes to some other election-related proposals. Roughly eight-in-ten Democrats favor Election Day registration (78%) and automatic voter registration (78%). By contrast, Republicans are divided on these policies – 49% favor each of them. Democrats are also far more likely than Republicans to favor allowing convicted felons to vote after they have served their sentences: Fully 82% of Democrats favor this, compared with a smaller majority of Republicans (55%). Similarly, while majorities in both parties would support making Election Day a national holiday, Democrats (71%) are 12 percentage points more likely to say this than Republicans (59%). And although about nine-in-ten Republicans (91%) favor requiring a photo ID to vote, a smaller 63% majority of Democrats favor this policy. Republicans are more likely than Democrats to favor two policies related to removing names from voter lists: “removing inaccurate and duplicate registrations from voter lists using automatic methods” (15-percentage-point partisan gap) and “removing people from registration lists if they have not recently voted or confirmed their registration” (19-point gap). Both overall and within the parties, these two proposals are viewed very differently from one another. About three-quarters of Americans (77%) say they favor removing inaccurate and duplicate registrations using automatic methods. 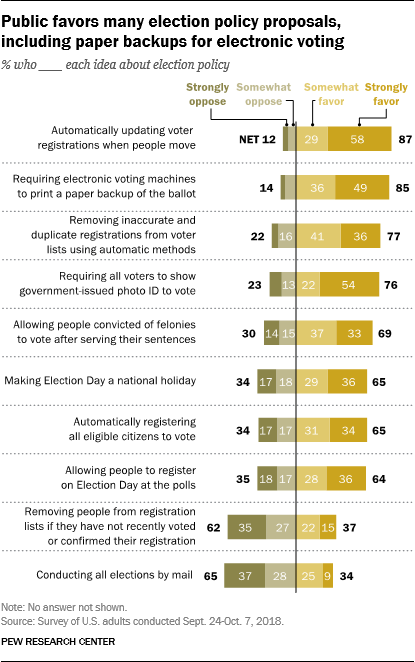 At the same time, about two-thirds of Americans (62%) oppose removing people from registration lists if they have not voted recently or confirmed their registration. And while Republicans and Republican-leaning independents are 15 points more likely than Democrats and Democratic leaners to favor the automatic removal of duplicate or inaccurate registrations, large majorities of both parties are in favor of this (85% and 70%, respectively). 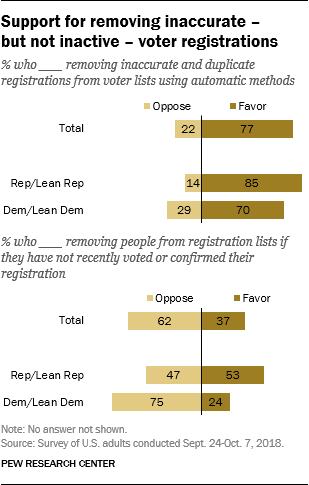 When it comes to proposals to remove those who haven’t voted recently from registration lists, Republicans are divided (53% favor removing inactive voters, 47% oppose this), while 75% of Democrats are opposed to taking voters off the rolls if they have not voted recently or confirmed their registration. When it comes to some policies related to making voting easier – automatic voter registration, same-day registration and making Election Day a national holiday – there is generally more support among younger people than older people, and these age differences are much more pronounced among Republicans than Democrats. For instance, while 76% of Republicans ages 18 to 34 would favor allowing voter registration at the polls on Election Day, support for same-day registration falls to just 22% among Republicans 65 and older. Similarly, although 74% of Republicans under 35 and 68% of those 35 to 49 favor making Election Day a national holiday, just 43% of those 65 and older say the same. Republicans under 35 also are 19 points more likely than those 65 and older to favor automatic voter registration (58% vs. 39%). These age gaps are seen both among those identifying as Republican and those who lean to the GOP. By comparison, there are only modest differences in these views across Democratic age groups, with clear majorities of those in all age groups favoring all three of these policies. 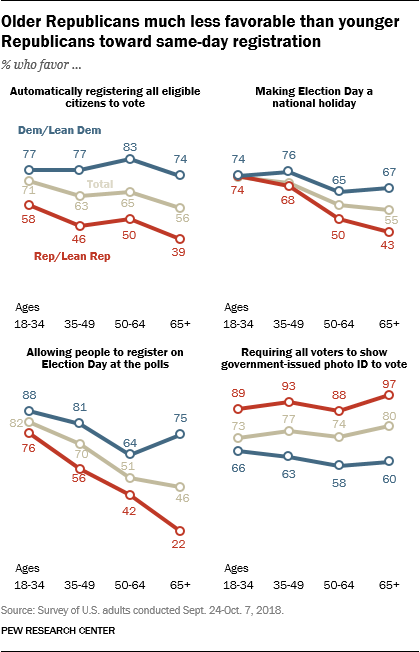 In contrast, views on a photo identification requirement differ little across age groups in either party. Across age groups, roughly nine-in-ten or more Republicans favor requiring voters to show photo identification, while about six-in-ten Democrats say this. A smaller overall majority of those in states without Election Day registration (61%) favor allowing people to register on the day they vote. And the partisan divide in these states is much starker: On balance, Republicans in these states are more likely to oppose (55%) than favor (45%) same-day voter registration. Among Democrats in these states, about three-quarters (77%) support same-day registration. Within the Democratic Party, 63% favor requiring voters to show government-issued photo identification to vote, while 37% oppose such a requirement. Democratic support for a photo identification requirement varies by education: Those with postgraduate degrees are the only educational group in which a majority does not back this proposal (instead, this group is roughly divided: 47% favor, 53% oppose). Among those with a bachelor’s degree, 59% favor this requirement, and about two-thirds of those with some college experience (67%) and a high school diploma or less (69%) say they would favor requiring all voters to show photo identification to vote. 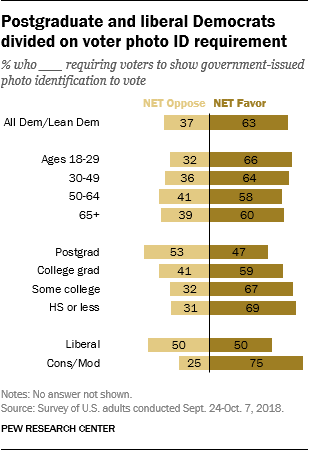 Liberal Democrats are also divided in their attitudes toward requiring photo ID (50% favor, 50% oppose). In contrast, 75% of conservative and moderate Democrats would favor an ID requirement and 25% would be opposed. Democrats living in states that already have some type of voter identification requirement are more supportive of requiring voters to show government-issued photo ID to vote than those living in states with no such requirement. A clear majority of Democrats living in states with a voter identification requirement (70%) support requiring voters to show identification in order to vote. Democrats living in states with no requirement are divided in their attitudes (53% favor, 46% oppose). There are no significant differences in opinions on this proposal by age among Democrats.